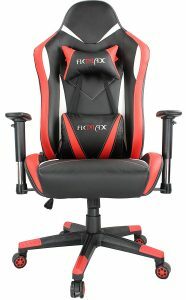 The Ficmax RFS-06 is the latest brand new ergonomic and stylish, heavy-duty gaming and racing chair with massaging back support with USB connection. This is a high-end durable, sturdy, functional, good looking and comfortable chair with quite a bit to offer. But let’s find out if the price of this chair is competitive enough. It may be great for you if you game or work for hours at the desk and want something super comfy. There is a lot of emphasis on ergonomics on this cobra shaped racing chair. It offers great support for your lower back- lumbar, upper back, head, and lower body and will fit by adjusting to your body shape. The back is wider on this chair and the cushion on the seat is big for people of different sizes. Foam padding is rather thick and has a decent quality PU leather covering. The great massage with vibrations will be good for any fatigue you may have on your lower back. The chair rotates 360 degrees and you can tilt it at 90 and 180 degrees. The heavy-duty base with castors is built quite sturdy and makes it more stable and the maximum user weight it can carry is 300 pounds. The seat can be adjusted for height between 18.8 and 22 inches and the whole chair between 50 and 53.1 inches. The seat itself measures 16.5 x 22.8 inches, which is more than adequate for most people unless you’re very large. You can adjust it for height very smoothly and easily and the armrests are also totally adjustable. In the box, you have the Ficmax RFS-06 Gaming Chair, a lumbar cushion with a USB massager, a headrest cushion, and the instructions manual. You have four colors to choose from, black with blue, purple, green or red and the price is same for all. If you sit a lot and have back problems, this chair may be perfect for you with all the back support and comfort level it offers and tilts, reclines and rocks. You can recline it to 90, 100, 120 and 150 degrees but you can use the armrest when sitting at 90-degree upright position. With the very high-quality gas spring that is explosion-proof and an integrated metal frame, this is a very safe and stable unit. It is a heavy-duty product that weighs 26.3 pounds and measures 33.8 x 12.6 x 25.2 inches, so please measure your available area as it may be quite large for a small room. One of the customers pointed out that the USB port needs to be plugged into the computer directly if you don’t want to have any problems. FicMax Chair is sent partly assembled but you’ll be able to put it together quickly with the easy to follow and clear instructions. It is easy to clean the PU leather and is resistant to fading, has a very permeable and resilient thick sponge. The frame has a warranty for the lifetime and the other parts have a year. You can even have your money back within thirty days and there is good customer support available if you encounter any issues. 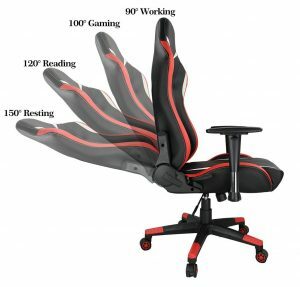 This is a great value gaming, racing and home office chair that offers as much as some of the very expensive chairs on the market.